The weather man had been predicting rain that never came for days and we were all worried that we would have to do a rain dance to have a nice day for the wedding. But the day grew beautiful and remained so into the evening. It couldn’t have been a more beautiful day to celebrate the relationship of this lovely couple. Hannah and Steven are both pharmacists so of course they wanted this to be included somehow in the festivities. In the end, they decided to place a mortar and pestle atop the beautiful wedding cake, designed with much attention to detail by Gregory Bingham, of The Art of Cake. This was the first time I had ever seen a cake designed by Gregory, who calls himself a “sugar artist,” and he definitely is. Steven told me that he and Hannah had worked with Gregory to create the design of the cake so it would look like a garden trellis full of red roses to accent the Bridesmaid dresses, with the mortar and pestle at the top containing even more red roses. It was the most elaborate cake I have ever seen and it must have taken Gregory forever to make it. Brian Mullins, of Brian Mulllins Photography, was on hand to photograph the day and one of my many favorites of his photos is included in this post. 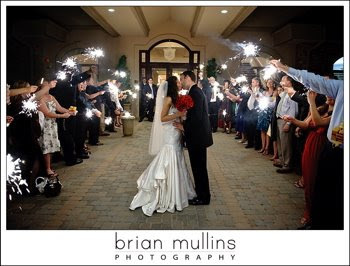 Brian definitely has an eye and a patient and thoughtful manner and the photos he posted on his blog from the wedding reflect this in the touching, human moments he captured as well as the splendor of the day. The wedding took place on the scenic back terrace of the beautiful Governor’s Club. Overlooking the lush, bright green of the fairway, the elegant floral arrangements provided by The English Garden were all that were needed to accent the beautiful stonework of the terrace. The reception was inside the ballroom with more incredible floral arrangements on the tables... and with Joe Bunn DJ Company taking care of the music, the evening promised to be a very special celebration for Hannah and Steven, the new Mr. and Mrs. Allison. Hannah and Steven, may your life together be just what the doctor ordered!